By Skye Wellington, March 11th, 2018 for Nuwa, Singapore. Link. Could you feel the change Friday night? Did you feel a shift in energy? It caught on the breeze and wafted across Singapore with the scent of soil conducted by a white noise buzz. You might have missed it as it lingered and crackled like a neon sign somewhere between the Friday night chardonnay and the char kway teow. But it was there, subtle and persistent, a circuit of fairly lights connecting between trees and lighting up our island garden like magic. It was the gentle force of 50 women coming together to share stories, show support and find strength in numbers. 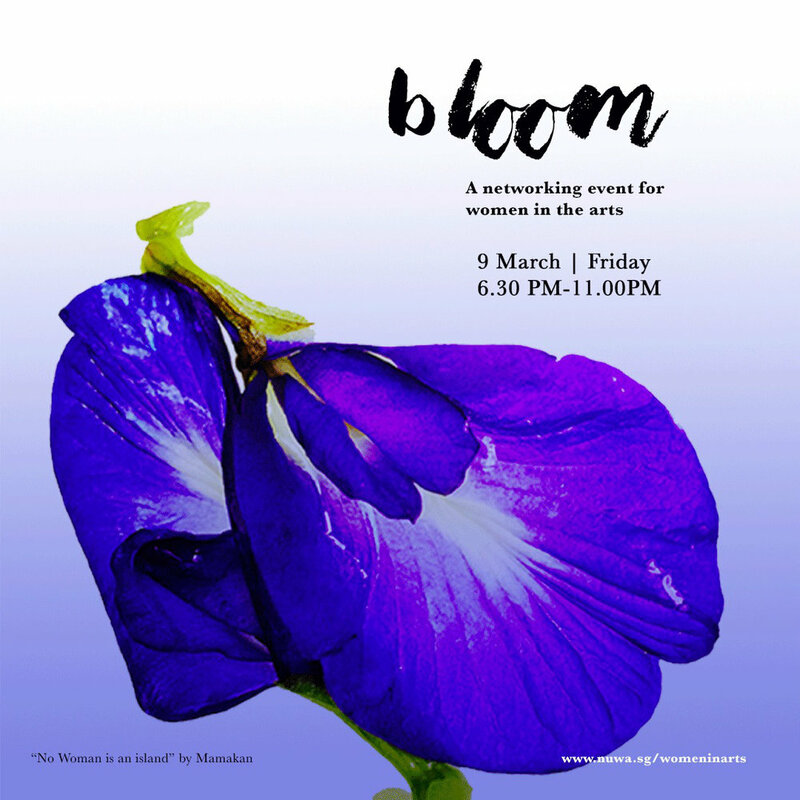 It was the first ever Bloom event – a chance for women connected to the arts to connect with each other. Bloom is a collaboration between seven Singapore-based arts advocates who see the untapped potential in drawing together creative women in a setting that inspires, surprises and provides an opportunity for meaningful exchange. The guests were botanical artists, writers, TV producers, fashion designers, photographers, theatre directors, children’s book illustrators and women who make and give. These rich ingredients were a great mix with some sweet results. The night began with an intimate dinner hosted by each of the Bloom Founders. We had been notified in advance of where to go but we didn’t yet know who our companions would be. Like a blind date that didn’t go bad, we arrived one by one at the houses of Elaine Friedlander, Nuwa artist network founder co-hosting with illustrator Julie Lee, botanical artist Mamakan, Canvass Yoga and Art Studio creator, Jolie Ow, organiser of Music and Makan, Beverly Hiong co-hosting with artist Cecile Spirit, and illustrator founder of My father’s illustrations, Debasmita Dasgupta co-hosting with portrait photographer Theresa Olesen, where being bashful shortly gave way to being bold. The instructions were simple: bring a dish and bring a story. And how we talked. It’s clear that Bloom is on to something. With each dish devoured (and each wine downed we’re not embarrassed to admit), we heard from different backgrounds but couldn’t help to notice the commonalities between us. We tripped over ourselves with words of encouragement and offers of introductions. And after dessert we got our just deserts, a beautiful gift that we may not have known that we deserved…. As the night grew balmy, chariots arrived (aka our Singapore party bus), and we were whisked away to a secret location where frangipani trees grew. Arriving at the private home of fashion designer Neima Sitawi in Emerald Hill, we were treated to a veritable visual feast: an art installation and soundscape created by Mamakan, and a soulful singing bowl session led by Jolie, were interwoven with a chance to mingle with the women who attended simultaneous dinners. It was an edgy idea with warm and wonderful results. This was a networking event with a difference. There was the usual business card exchange, though a lot of us forgot to bring those or were too deep in conversation to remember passing them on. What made it unique was the recognition that those that provided the environment really care about their cause and the recipients that attended met that passion with a disarmament and humility that so many women want to share, but struggle to find the right forum for; a place to unfurl our petals, show our softness and be vulnerable. For all the hard-edges of the business world, it’s like a breath of fresh air to find a space like Bloom where creative women can restore each other. Foraging and shopping for the tonight's welcome cocktail. Several dinner tables ready around Singapore, this one in my old shophouse at Niven Road. Served on my grandmother’s handprinted porcelain with native Danish flowers. Each guest brought a dish to share with a personal story. Before tasting the food, the personal story is shared. Two of the beautiful hosts for BLOOM 2018: Beverly Hiong and Cécile Spirit with guests Julienne Chan, Fiona Silva, Damaris Carlisle, Akiko Otao, Charlie Leong, Nawel Hammoumraoui. Guests arrived a the post-dinner secret, surprise location on Emerald Hill. Mamakan and Elaine Friedlander sharing notes and ideas. Eleine Friedlander, the founder of Nuwa, did a wonderful welcome speech. The soulful singing bowl session by Jolie Ow, Canvass Yoga and Art Studio creator. Mamakan introduced the ideas behind “Daughter of the Soil”. And playing the sound scape made from the poem and 27 women reciting it. Guests were sitting on the floor around the “Daughter of the Soil” installation creative an atmosphere of wonder and intimacy. Mamakan’s sharing ended by passing around the perfume made for “Daughter of the Soil”. Followed by a moment of silent and sensorial reflection as we digested the work. The nightcap with some of the co-founders of Women in Art, Singapore. From left: Beverly Hiong, Mamakan, Debasmitha Dasgupta, Madina Khamitova and Jolie Ow.